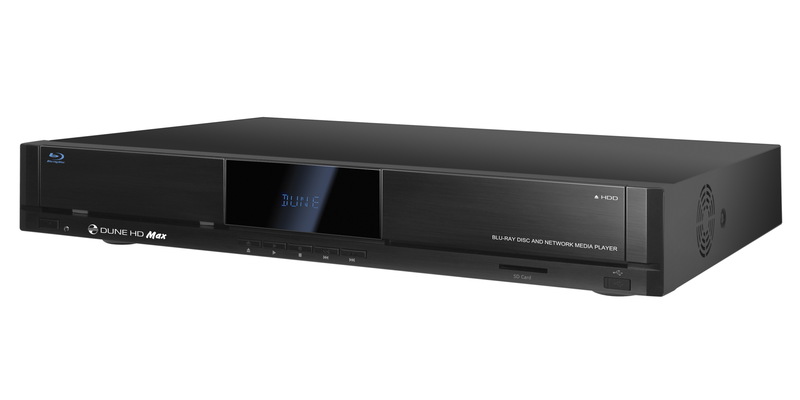 HDI Dune unveils its flagship model media center under the name Dune HD Max, which combines and expands characteristics of their popular Dune BD Prime 3.0 and Dune HD Base 3.0 media players. 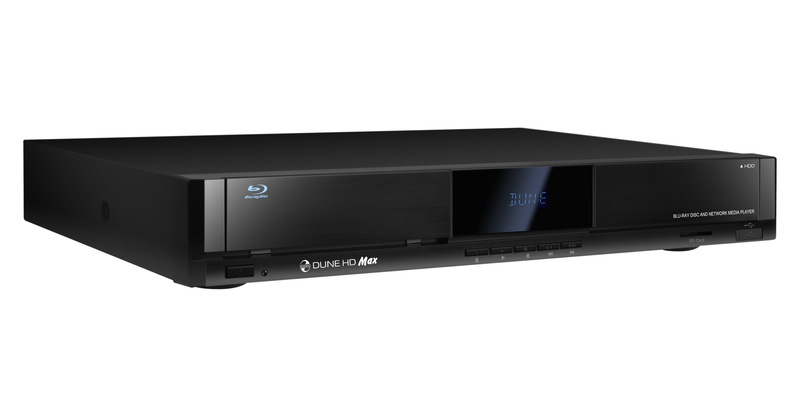 Dune HD Max is equipped with Sigma Designs SMP8642 video processor, 512 MB RAM, has 3.5″ SATA HDD rack with hot-swap support, built-in Blu-ray drive, SD card slot and three USB 2.0 ports for connection with external storage and extension modules. The media player also have special compartment for extension boards like DVB-T/T2, DVB-S/S2 and DVB-C (terrestrial, satellite and cable TV), located at the rear, that allows up to 2 boards to be installed simultaneously. 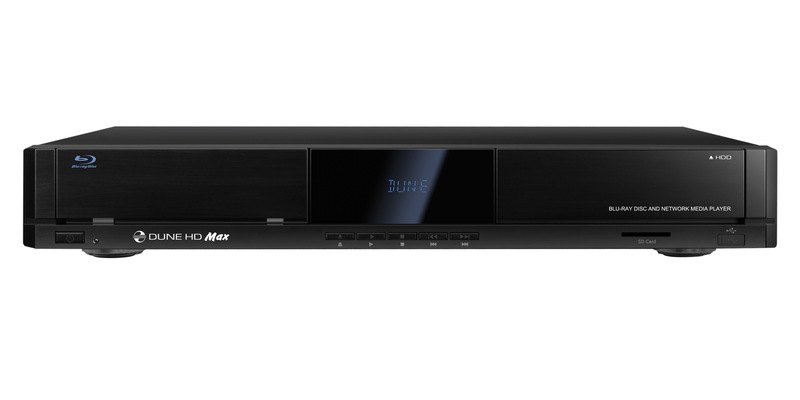 The Dune HD Max supports practically all audio and high-definition video formats, plays DVD and Blu-ray discs and images,support IPTV and Internet Radio functions, as well as built-in torrent-client and Internet browser. 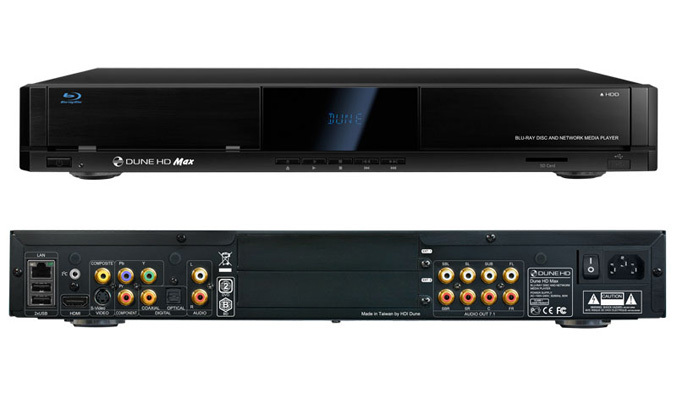 HDI Dune promise regular firmware updates for new functions and formats. 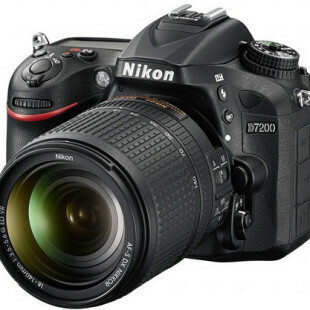 The HD Max is coming with a two-year manufacturer’s guarantee and will be available September with MSRP 499 USD in the USA and 499 EUR in Europe (inc VAT). The newest Sigma Designs 8642/8643 media processor: enjoy excellent playback and performance of interactive features. Blu-ray and DVD player: play Blu-rays and DVDs (plus Audio CD and data discs with video/music/photo files). HDD player: connect an HDD to the player and play content directly from the HDD. Network player: connect the player to a local network and play content directly from PC or NAS (UPnP, SMB, NFS). MKV player: play HD and SD video in a popular MKV format and other modern video file formats, including top quality HD video with very high bitrate. RealD: watch 3D video in this ultra modern format used in cinema for the latest movies. HD audio: enjoy top-quality audio tracks (Dolby True HD, DTS HD Master Audio, LPCM, FLAC). 3 USB ports: conveniently connect HDDs, USB flash drives, USB card readers and other USB storage devices. HDD rack with hot swap function: easily and quickly insert and exchange internal 3.5″ SATA HDD. SD card slot: easily play media files on SD memory cards from your camera or other devices, or use an SD memory card as a local or system storage (required for BD Live function). HDMI 1.3: ensure the best possible quality of HD video and HD audio. A rich set of standard A/V connectors: use S/PDIF optical audio, stereo audio, component video, composite video outputs to easily connect any A/V equipment. 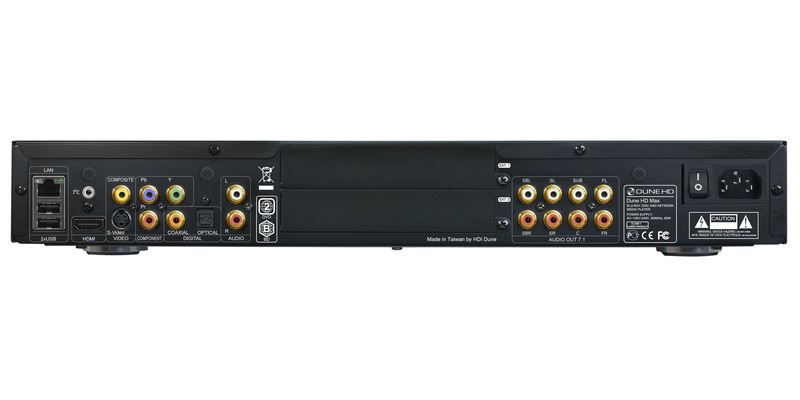 Extended support for Dolby True HD and DTS HD Master Audio: output bitstream (up to 7.1 channels) or decode (up to 7.1 channels) for maximum flexibility when connecting audio equipment, and for extended support of advanced playback features (such as Picture-in-Picture). Video output flexibility: output video in any resolution and format (from SD to 1080p, 24p/PAL/NTSC). Upscaling: high quality upscaling of DVD and any other SD video content to Full HD (1080p) or other HD resolution. File browser: convenient file browser with powerful file management (copy, move, delete, rename, organize, sort). High-quality music playback: play very high-quality (up to 192 Khz / 24-bit) music files in various formats (FLAC, Monkey’s Audio APE, WAV/PCM, DTS, etc). Playlists: build playlists from your folders, use your own playlists, use repeat and shuffle functions. NAS function: access files on storage devices (HDD, optical drive, etc) attached to the player from the local network (using SMB or FTP). BitTorrent: use built-in BitTorrent client to download files from P2P networks. Customizable user interface: work with media collections using cover art and icon browsing (with Full HD graphics). Flash applications: extend the player functionality with FlashLite applications. Internet radio: playback and record various Internet radio stations (HTTP/MP3). IPTV: playback and record IPTV streams (multicast UDP/RTP) from your Internet provider (check availability of multicast UDP/RTP streams with your Internet provider). Digital TV option: playback and record Digital TV channels using an optional Digital TV USB dongle (Digital TV USB dongle is not included; this option can be purchased separately). Internet browsing: view Internet Web sites on your TV using the built-in Web browser (built-in Web browser has limitations and may not allow to view some Internet Web sites).